We headed into Juneau to do some shopping in The Big City, where we can find Costco, Home Depot, and a big Fred Meyer store. We have two grocery and hardware stores in Petersburg, but the prices and selection can’t compare to the capital city. 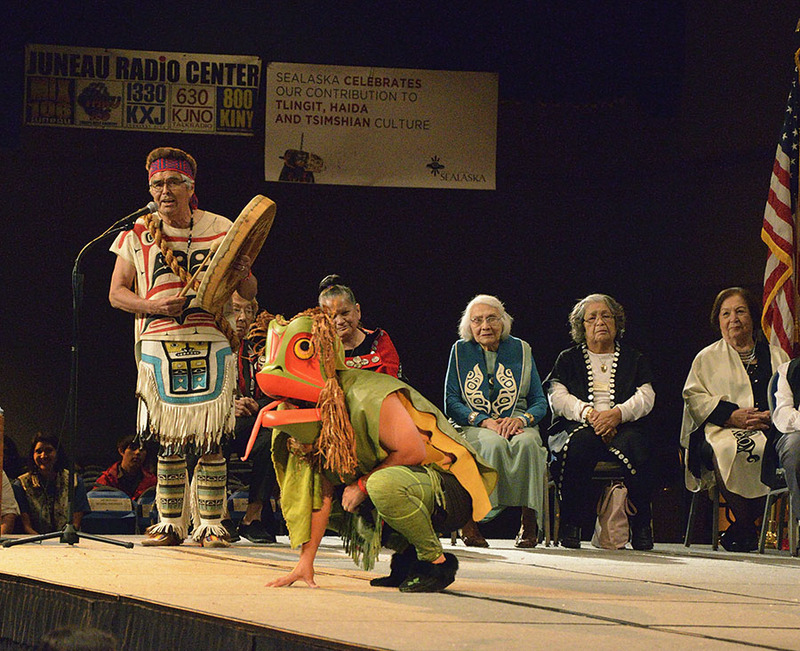 We tried to arrange for a rental car to do our shopping, but we discovered that the biennial Native Celebration was going on that week and there wasn’t any hope of getting a car. That was the bad news… and the good news. We managed to borrow a car from friends for a few hours, and with well-organized lists in hands and a brisk pace we got a lot accomplished. 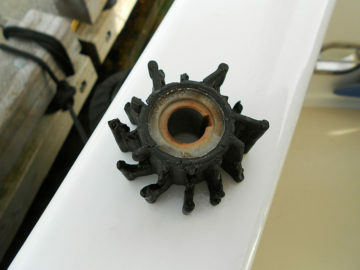 We were also having some cooling issues with the generator, and when Jim replaced the impeller it was obvious what the problem is. Oh, and you also have to find all the little bits of broken off blades downstream in the cooling system, or they’ll continue to cause problems. Once the shopping and the generator were taken care of we could take some time to enjoy the city, particularly the State Museum which JUST re-opened after a lengthy renovation. I’ve been wanting to see it ever since we moved up here, and the new displays did not disappoint! It was also a treat to eat out for a change, and the restaurant just around the corner from the museum had some fantastic lunch specials. One of them should just be named the “Jim Roberts”, because it was a peanut butter waffle covered in sauteed bananas and candied pecans. Jim was thrilled. We typically prefer the quiet wilderness over the bustle of the city, but we’re open to new experiences… especially the culinary kind! So besides the surprise of the State Museum re-opening just two days earlier, we thought we’d check out the Celebration events. 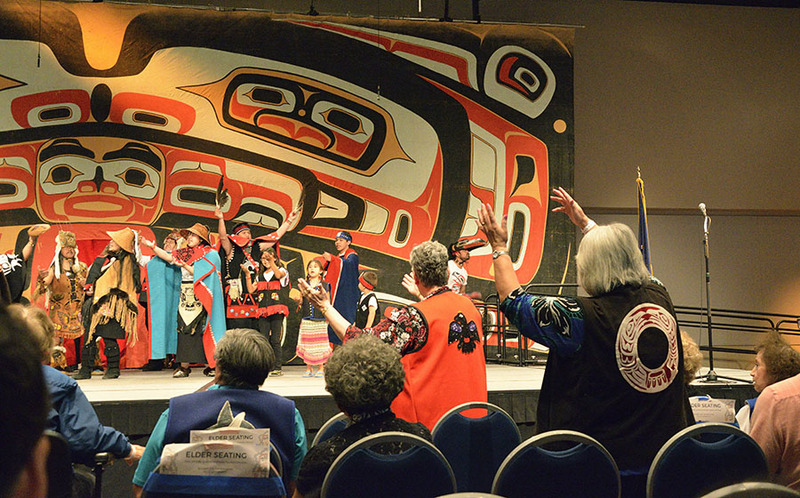 Celebration occurs every two years, and it’s primarily focused on the Tlingit, Haida, and Tsimshian tribes of southeast Alaska and northern British Columbia. It was fantastic – like a gigantic family reunion. We spent two days watching dancing and drumming, listening to the native language speakers, and learning more about the culture. 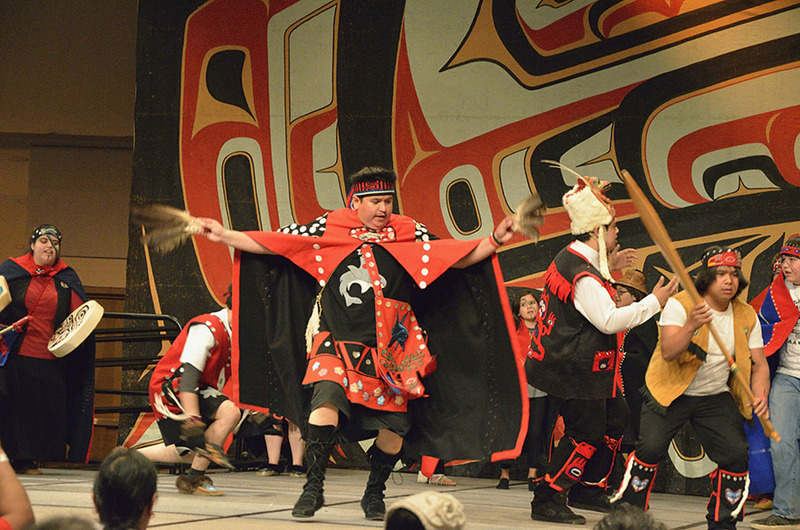 The first thing you notice is all the regalia, highly personalized and decorated with symbols of the person’s moiety, clan, and house. Everything is hand-made, and some items are quite old. The speakers introducing the various dancing groups all spoke in their native language first, then translated into English. 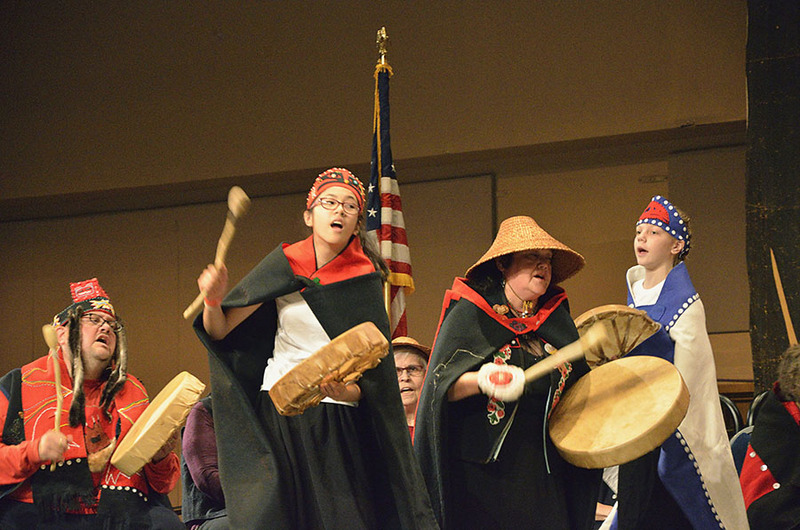 A Tlingit gentleman sitting next to me told me that even as recently as four years ago we would not have heard much native language, and he was astounded at how many people were proficient. 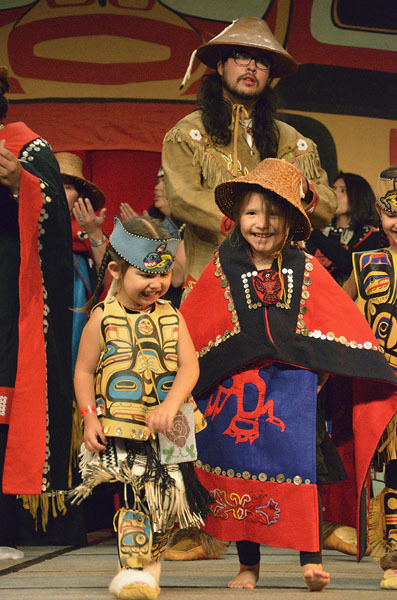 The Juneau school system now has a Tlingit program in the elementary school that teaches culture and language every day! 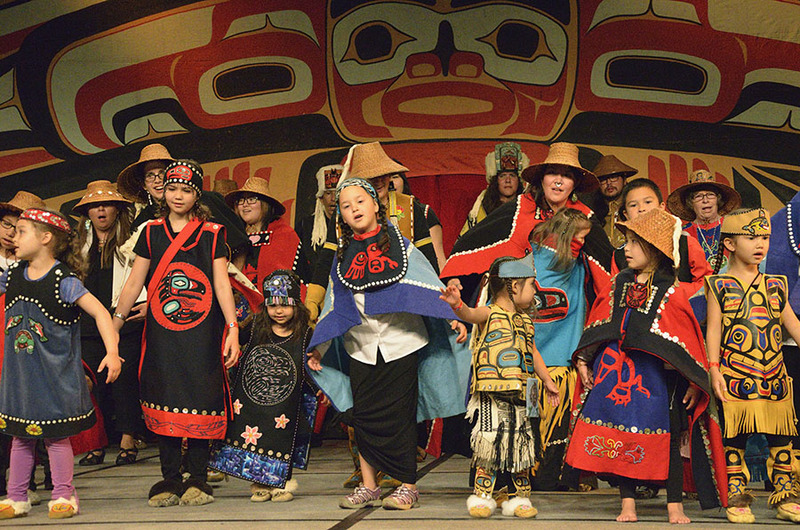 Both the U.S. and Canadian governments tried to eliminate the native culture and language, almost succeeding in erasing thousands of years of development. 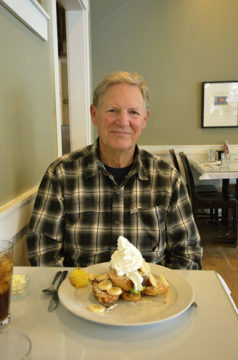 The great-grandparents and grandparents of the current generation still remember the old ways and stories, but the parents of the current generation were raised in a sterile environment. 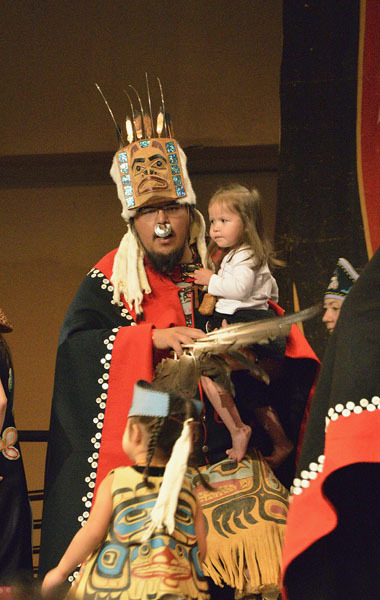 Thankfully interest in the native ways is experiencing a great resurgence, particularly among the young people, and they are capturing as much knowledge as they can while their elders are still around. 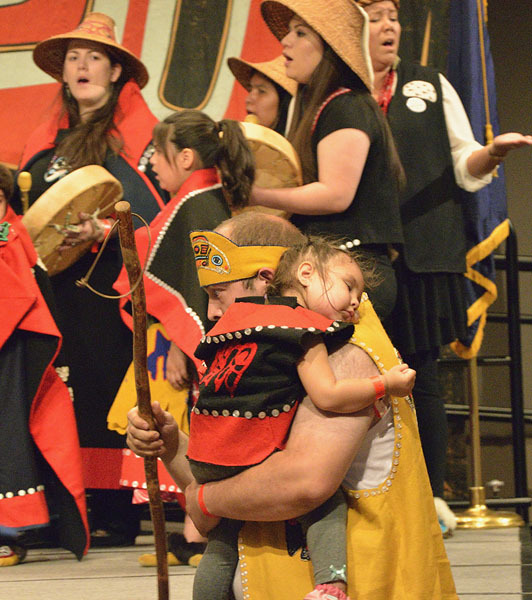 These people have suffered civil rights injustices for over 200 years at the hands of various European settlers, and then the U.S. and Canadian governments. They remain hopeful and patient, relentlessly trying to preserve their heritage and reclaim some of what has been taken from them – the first residents of this land. We continue to mourn horrific events around the world caused by hatred, intolerance and misunderstanding, and we need to remember that we’re all One Human Family and that our differences, working together, make us all stronger. 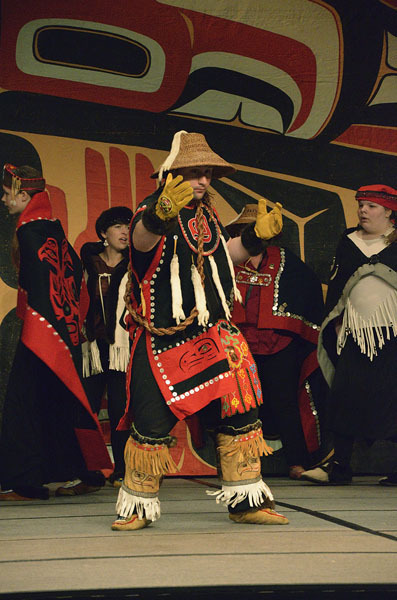 One of the beautiful aspects of the native culture is respect for elders, reflected in reserved seating in the front rows for elders only, and the number of elders who were seated on the stage during every dancing performance, drumming or just moving their hands while seated. Audience participation during the dances was frequent and welcome, sometimes from the seats, and sometimes people would be invited up on stage. 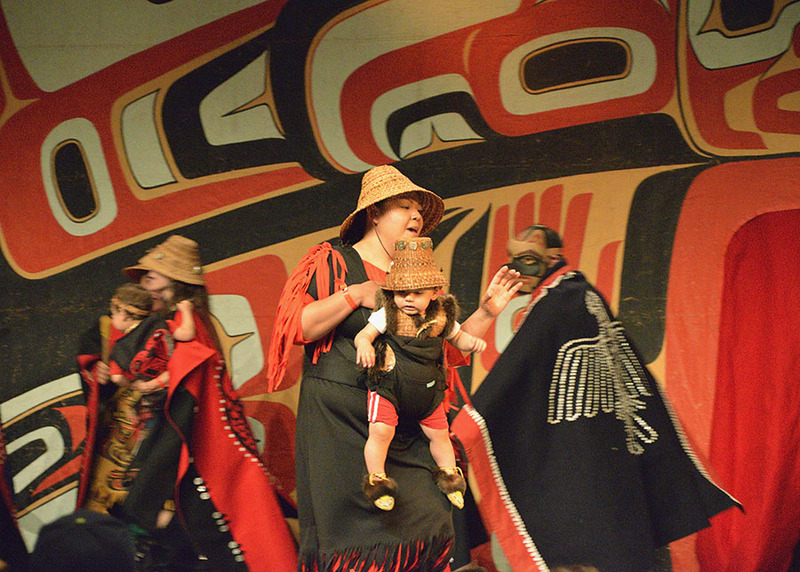 It’s hard to choose a favorite thing about Celebration, but I loved seeing all the little children on the stage – infants riding in carriers, held in arms, or toddlers dancing in their own way. EVERYONE was included – it was just beautiful. I’ I’ll post more photos and video in the next installment… stay tuned.